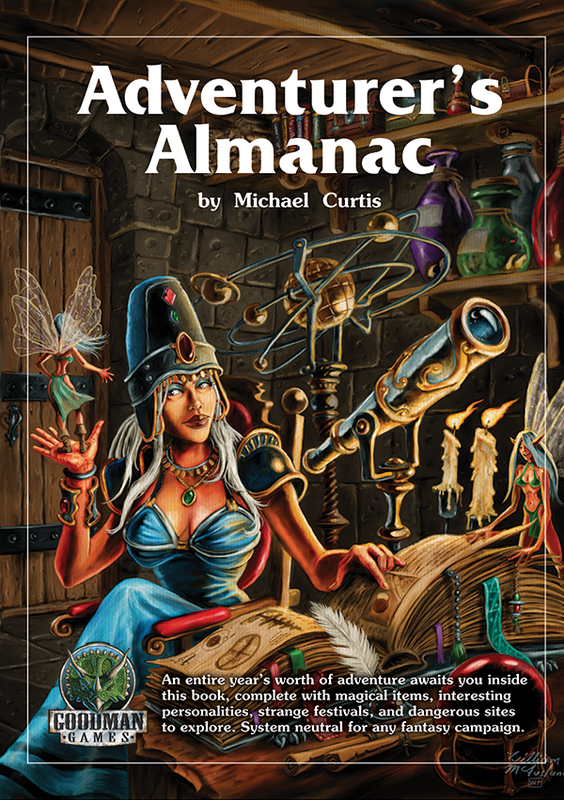 The Adventurer's Almanac was written by Michael Curtis. Art was provided by Tom Galambos, Fritz Haas, Jim Holloway, Cliff Kurowski, William McAusland (who also did the cover), Jesse Mohn, Stefan Poag, Chad Sergesketter, and Mike Wilson. The publisher is Goodman Games. This is a hardcover, system-neutral book with a sewn-in ribbon bookmark (presumably to keep your place in the Grand Course of Days, a calendar of 13 lunar months. Although the product is system-neutral (and therefore an honorary Treasure in the Trove), the themes and flavor would work well for a Dungeon Crawl Classics campaign milieu. The product provides astrological information, moon phases, holidays, and events that can take place over the course of each month. Readers as old as I am (or older) may fondly remember the appearance, in the 1st Edition Advanced Dungeons & Dragons Oriental Adventures tome, of a system to plan events on a persistent calendar. 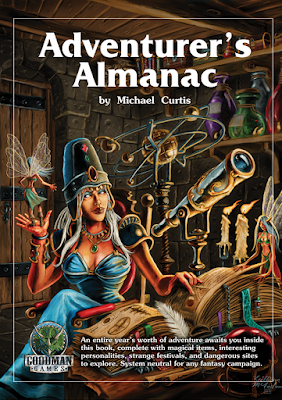 Michael Curtis takes the idea a good step farther than did Gary Gygax, David Cook, and Francois Marcela-Froideval, but the spirit seems to be very much the same. An entire year's worth of adventure awaits you inside its pages, complete with magical items, interesting personalities, strange festivals, and dangerous sites to explore, all presented in a system-neutral format suitable for any fantasy campaign. Be aware that these are seeds, for the most part. You will have to do some work to turn them into adventures. You will have to determine how to convert the system-neutral format to Dungeon Crawl Classics statistics - but you will be inspired, and the work will not be that difficult. The utility of most of these pieces is undiminished if you carve the book up and use it as inspiration to plan your own fantasy calendar. Indeed, the author has foreseen this use and made it easier for you by providing you with a calendar blank. Copying the blank will also allow you to use Michael Curtis' calendar as written - either for taking notes or extending the years beyond that which is provided. Goodman Games has provided a free, 17-page preview of the content.